We are a Tesla Destination Charging location. Feb 17 - 4th Annual Winterpaloozah! We welcome you to our B&B, Rangeley's most refined lodging in the Rangeley Lakes Region, with amenities that today's travelers want to find. Situated in the Western Mountains of Maine, we offer luxury accommodations, including five private guest bedrooms, which you will find spacious and welcoming. Each guest bedroom has a private bath, satellite television, and individually zoned heat. The B&B also has two generous guest living rooms with gas and wood stoves. For your convenience, we provide wireless internet and a guest computer. With many outdoor activities in the area, we are sure you will find plenty to do. We have ample parking for boat or snowmobile trailers, and are on the local in-town snowmobile route. Saddleback Maine ski area and the Rangeley Lakes Trail Center are only 10 minutes away, and our Inn is a half mile from downtown Rangeley and Rangeley Lake. local Registered Master Maine Guide. We will also book sightseeing seaplane rides, taxi service, pickup at the local airport, and more. 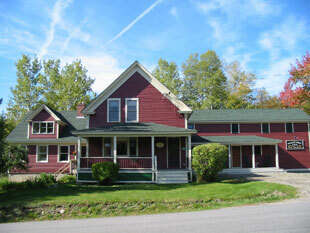 Pleasant Street Inn provides an ideal setting to relax and enjoy the comforts of a home away from home. Our Inn is also perfect for a romantic get-a-way, small corporate retreat, and a fabulous location for a wedding party base camp. We are sure you will enjoy our beautiful Rangeley Lakes Region and Pleasant Street Inn is the perfect place to experience all the magic that Rangeley has to offer.